Reliance 3G Tab ZTE V9C Rooting and Unlocking Video Guide shows you step by step guide to root, unlock, use whatever Moded ROM you want so that anyone can do. The Physical Android Tablet part is not shown, which is quite easy to do. First watch this Reliance 3G Tab ZTE V9C Rooting and Unlocking Video Guide, then read our text guide, download the things needed and straight forwardly do the exact things we did in this Reliance 3G Tab ZTE V9C Rooting and Unlocking Video Guide. Anyone practically can do if follows the written plus video guide. Basically we downloaded all the files and kept inside one folder named Reliance 3G Tab. The work flow we have followed in this Reliance 3G Tab ZTE V9C Rooting and Unlocking Video Guide is actually among the basic of Reverse Engineering. As these tools has some limitations, we avoided the error windows prompt by creating User named folders. It does not matter whether you will exactly do in that way or not. If you still can not root it, you can write your problem here. The workflow we have shown is very very easy. You will be tempted to change and flash the ROM everyday. But it is more important to build custom ROM with all the working drivers, which is actually still not done by anyone. This Article Has Been Shared 8916 Times! Run Android Apps on Windows 7, even full at screen with BlueStacks App Player. Bluestacks is very well designed and has a comfortable interface and simple. Run Commands on Android Device by connecting your Android device with your Windows PC using any USB cable and by using the usual Windows Command Line Tool. Best Screencast Video Recorder Apps for Android records your activity on Android for creating professional guide for your blog or for your dearest one. 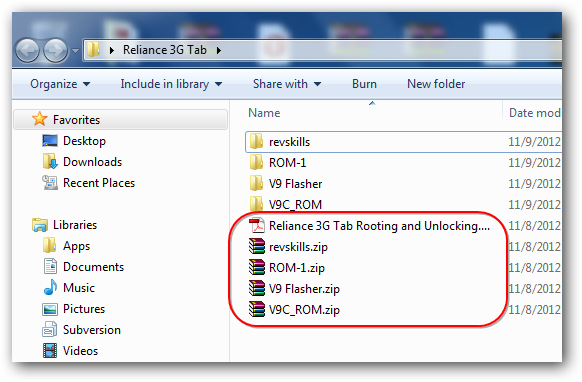 Cite this article as: Abhishek Ghosh, "Reliance 3G Tab ZTE V9C Rooting and Unlocking Video Guide," in The Customize Windows, November 10, 2012, April 26, 2019, https://thecustomizewindows.com/2012/11/reliance-3g-tab-zte-v9c-rooting-and-unlocking-video-guide/.